Great Lakes Power Vac is an experienced environmental services company providing reliable and cost-effective roof preparation and vacuuming services. As one of the Midwest’s most experienced industrial vacuum companies, we can be relied on for predictable, responsive, and high quality services. Our modern fleet delivers dependable results for every job. Weather is the unknown variable in the roofing industry. We know how important it is to show up on time and to work closely with clients to ensure work is expediently completed around weather delays. You can count on us to keep you informed when unexpected project variables or weather impacts job completion. We have worked hard to earn our reputation for delivering reliable, predictable, and responsive service. We provide all the necessary equipment to accomplish your project on time and within budget, including vacuum trucks engineered for commercial and industrial vacuum-loading applications and specifically designed to load and carry bulk materials. 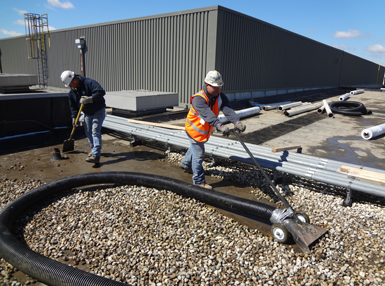 We remove ballast—ranging in size from pea gravel to coarse river rock, as well as non-embedded dirt and debris—to ensure roof readiness for repair or resealing. Our 15 cu. yd. capacity trucks can convey materials over long hose runs: excellent loading rates can be achieved over distances of up to 650 feet. Multi-story buildings can be vacuumed from distances up to 450 feet horizontally. Ballast can be dumped on-site or transported for off-site disposal. For a roof that needs to be cleaner than what a single vacuum pass provides, we can pressure wash or power broom the entire surface to remove accumulated dirt and smaller rock particles, then do a final vacuum pass. Our staff receives ongoing safety and compliance training that includes fall protection and personal protective equipment. We strive to ensure all our work practices and procedures are OSHA-compliant.